Blessings in Disguise: Happy First Birthday! Happy 1st Birthday, baby girl! I can't believe the day has finally come. I think last night was harder for me than today was. Today wasn't as brutal as I thought it was going to be, but was still rough. I kept thinking about how, on this day last year, I still had two more entire days with her, plus a visit to her foster-adopt home and one more visit the night she went home with her family (11/11/10). Also, knowing that her actual birthday party was last Saturday lessened the blow a little. Part of my sadness was over missing her party..so it helped that I didn't have that on my shoulders today, too. I headed to bed around eleven, and I slept with her little hospital hat in my hands the whole night. I just kept replaying last 11/01 over and over in my head, til finally I fell asleep. 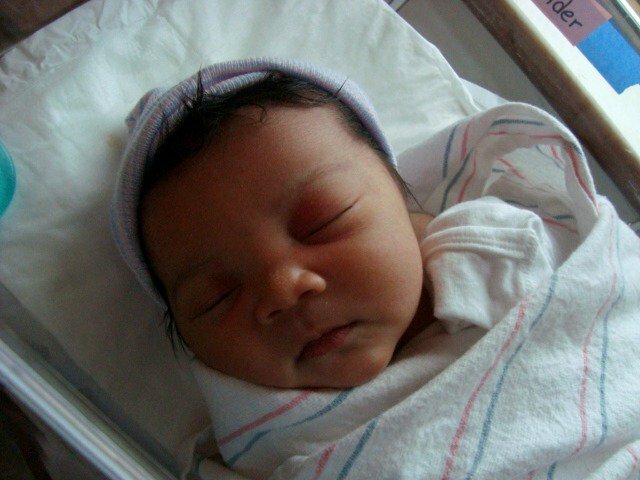 I woke up, wide awake, at 6:28 a.m., and stared at the clock until 6:31 (the time she was born). It was like I was back in that hospital room again...I could hear the nurses voice as clear as a bell, I remembered the lighting and the smells in the room and the fetal heart beat monitor beep beep beeping and thump thump thumping. I could even feel the starchy hospital gown on my arms. Words cannot express how proud I am of my baby girl, nor can they express how much I love and miss her. So I'm going to keep this short. I just wanted to let you all know (and for a reminder to myself) that it is Arianna's adoptive mom who made this day so bearable. I woke up to an email from her, telling me all about how much our daughter loved her party (and 'knew' the spot light was on her...that's my girl! ), loved ripping her presents open and loved our generous and amazing gifts to her. She promised to send pictures of her in her pj's and on her Disney ride-on that I sent to her. She also told me that she unexpectedly had to work a longer day than usual today, so she would have to postpone the phone call. BUT, she made it up to me a thousand-fold: she asked me, if it was okay with me, could we do a Skype call tomorrow night instead? Hmm...YES, in fact, that would be fine with me! hahaha. So, all in all, I'm surviving the day. I know it's not over yet, but I have that Skype call to look forward to now (and I am SO looking forward to it). I'm sure I'll post tomorrow afterwards, and maybe get some screen shots if possible. Oh, and, she also told me she's officially walking! She just started going long distances (as in, across a room) this past week! That was part of the reason why she wanted to Skype, also, so I could see her walking. I love her family more than words can say. Happy Birthday, my little princess! I may not be celebrating your day of birth by your side, but I celebrate it in my heart every single day...and today especially. I can still hear your first cry in my head as if it happened five seconds ago, I can still feel your silky jet black hair and hear you breathing beside me. I love you with all of my heart and my soul, and I thank you for all the ways you have helped me in your one year on earth. Some I will be able to tell you about, others you may never quite understand, but they are important nonetheless. You will always be my firstborn and my princess, and the biggest piece of my heart will always be yours. Happy Birthday, my love. (Hugs to you)) Enjoy the skype call. I bet that will be better than talking to her on the phone. How wonderful you get a skype call, enjoy it I know it will be so hard and so wonderful at the same time. happy first birthday to your beautiful baby, i hope you both had an amazing day. I hope that you had a wonderful Skype with your precious girl! soooo!!?!?!? i want to hear about the skype call! !